Hello! Hope you're all having a good week so far. Been a little busy for me and it's only going to get busier as I'm taking my little sister to university open days and she seems to have picked all the ones that are hoursss away. Typical hey? 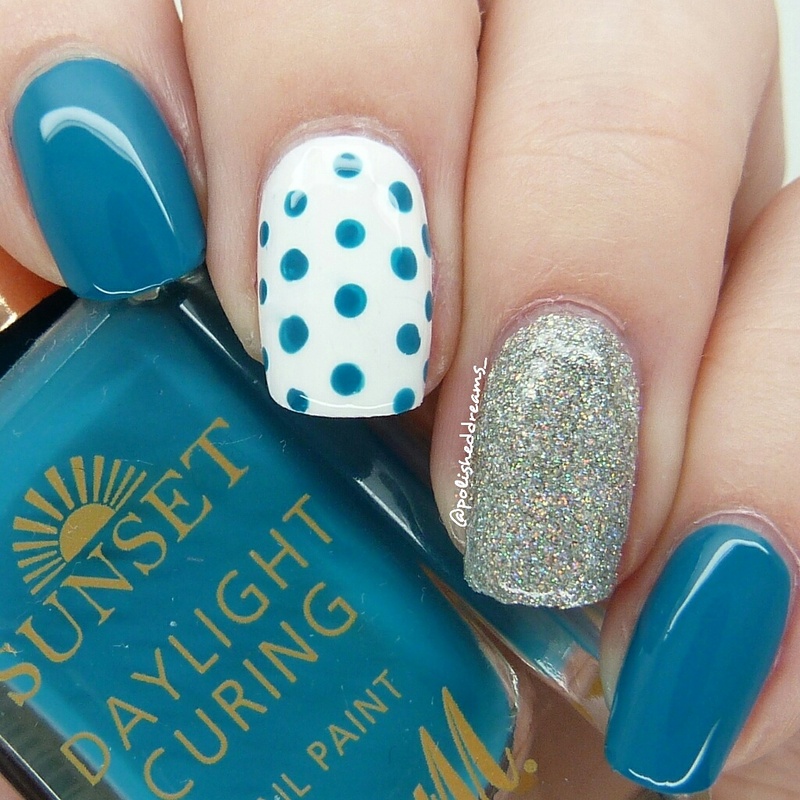 Anyway the mani I'm sharing today is something quite simple but still very pretty. I've always said that dots are one of my great weaknesses as I can never seem to make them look good so of course the answer is practice! As well as practicing techniques I've also been trying to dig out some polishes that I've left a little unloved. 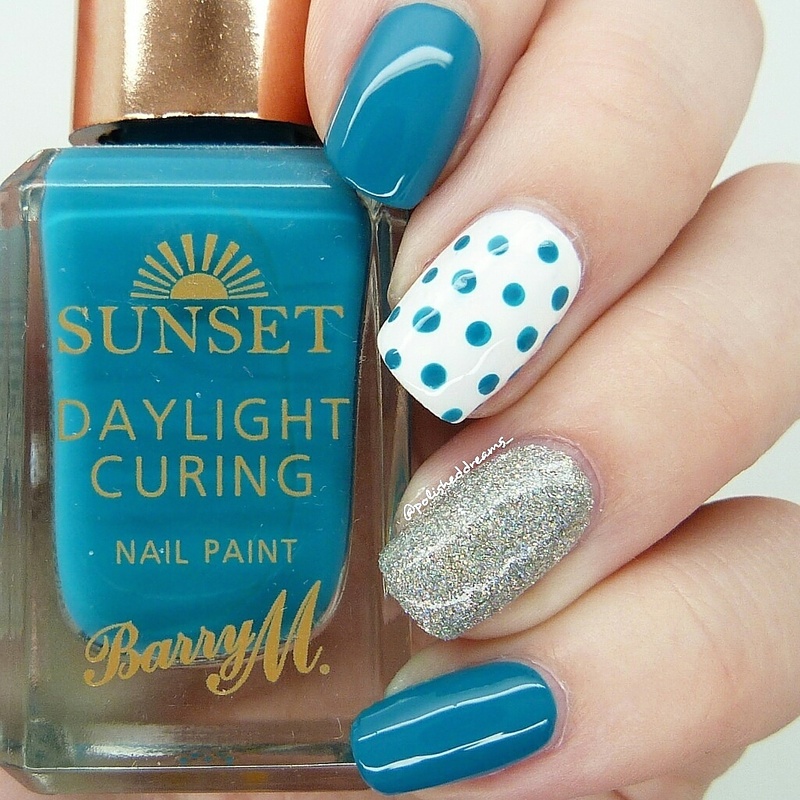 The main polish for this mani is The Way You Make Me Teal from Barry M and it is so gorgeous. It's from the Sunset range so has that amazing formula which I love and obviously the colour is beautiful. I also used White Van Girl from Ard As Nails and Cosmic Girl from Danglefoot Polish. I also recently realised I only have a mini bottle of Cosmic Girl (which is already half empty!) so definitely need to get a big one when Hayley reopens in September. I am actually pretty happy with how these dots came out so that's a good start! Now just need to figure out how to do the same on ALL my nails... This has definitely also helped me realise I need to use old polishes more as I often just find myself reaching for the same ones. I bet there's a lot more hidden gems in my little collection. I challenge everyone to do a mani using a polish they haven't used for a longg time!